Good morning! Here's a little somethin', somethin' to warm you up as the days start to get shorter and cooler. A yummy pumpkin pie latte! Mmmmmmm! This is a homemade version of the ever popular treats found in so many of our favorite coffee shops. I like it, not only because it's delicious, but because it can be made with things you have have readily available in your kitchen, and you don't need a fancy coffee machine to get all the yummy goodness you crave. Enjoy!!! This page was made with the gorgeous Ambrosia DP from Basic Grey, and the coffee cups were paper pieced from a pad of Cupcake DP, also from Basic Grey. Both can be found at the Scrapbook Store At Your Door. 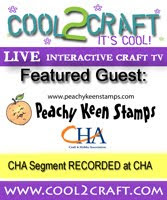 The coffee cup stamps are from Sweet -n Sassy Stamps Warm Up stamp set, and the pumpkin is from Peachy Keen Stamps PK-629. I used my black marker to only ink the outline of the pumpkin, so that I could leave the facial features of the jack o' lantern off of this image. I finished everthing off with some ribbon down the side, and the diamond brads on the cups. Thanks for joining me today! I always enjoy your visits, and I hope you will come back soon!! Have a glorious day, and happy stampin'!!! Here I am hungry again (thirsty in this case)! I always look forward to your recipe cards...my mouth starts to water and my tummy rumbles...so hard to stay at work and not run home to my kitchen! This is beautiful. I love love love the recipe, fall colors and images! Ooh this sounds delicious, love it! Okay, Lorie -- LOL!! I'm soooooo inspired to stop by my 'Bux and get a lil sumthin sumthin! ;) This is darling - so fall and festive and just brings such a warm feeling :) These recipe cards are just darling -w hat a wonderful legacy to leave them all for the future generations! Muah! Lorie, wow!!! I LOVE the colors and your coloring is out of this world!!!! You have to teach it!!!! I'm always looking forward to your recipes - they are such an inspiration - hugs to you , my friend! What fantastic things you make. I love your snowflake/snowman hanging decoration. And, your cards are beautiful. Holy moly!! I am sooooo gonna make this recipe!! Pumpkin Pie Latte is my FAVORITE~ I always go to starbucks the 1st day they start selling them~Now I can make it myself!! Beautiful recipe card & RECIPE!!! Oh yummy! Pumpkin pie latte is my all time favorite. I will be trying this recipe for sure! Your little coffee cups and that pumpkin are adorable! Love the Basic Grey papers too! I can't wait to try this out. This is so pretty!!! Love the oranges and how you blinged up the cups! Oh my heavens this sounds soooo good.. I have to try this one too. Lets see cinnamon rolls and pumpkin lattes..yummy.. Great job. Kit Cats On The Loose!!! Sweet -n Sassy Release Party Blog Hop! !